Pretty purple plum with fine, elegant somen noodles are all you need for a comforting evening meal at home. Light and refreshing, this recipe allows for much variation and versatility. Thank you, Junko, our host, for sharing this family recipe with us! When we first met her on our first trip, she looked really serious, but once we got to know her, she truly inspired us with her passion for food. Born in Hokkaido, she moved to Chiba when she was seven, and learned to cook very well from her mother. Remember the Vegetarian Sweet Potato Curry we launched last year? This was inspired by her as curry was her comfort food! Knowing how well she knows and loves her food, this recipe is surely a keeper! Gather ingredients for noodle soup, boil and leave to cool down. Prepare the condiments. Remove seed of umeboshi and chop finely. Shred ao-shiso and cut the myoga into small pieces. Boil the chicken fillet and shred. Grate the tomato (optional). Boil the somen and rinse with running water before serving in bowl with ice and water. 4. 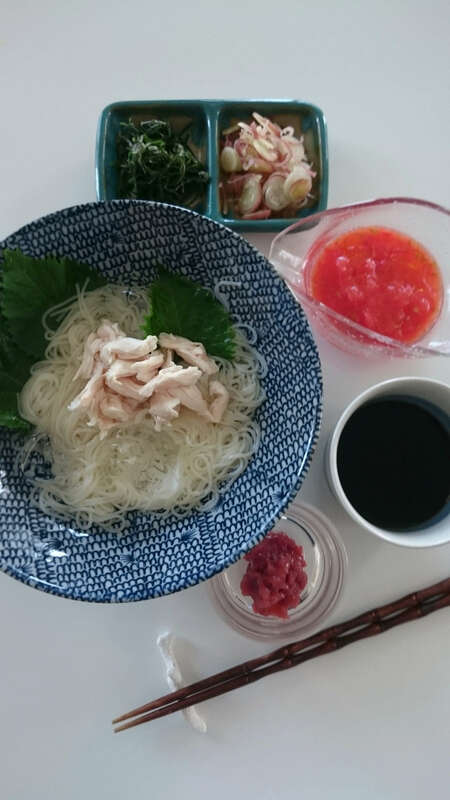 Enjoy the somen dipped in soup with condiments! * If desired, add grated tomato and olive oil into soup to balance umeboshi’s sourness. * You may substitute chicken fillet with canned tuna.